If you have watched Crazy Rich Asians, you would have realised the grandeur and extravagant elements in the Hollywood movie. And that includes the floristry on set, which is the work of Malaysian florist Eunice Teo, an American Institute of Floral Designers (AIFD) certified floral evaluator and judge, the only person in South-East Asia who holds the title. Both the cast and crew in the movie were bowled over by her creations, including production designer Nelson Coates, who was shocked that it was the first movie she worked in and said that her work was the best floral arrangements he had ever seen in his entire career. Recently, Teo was also involved in the floristry for another Hollywood movie, which is due for release next year. From as far back as she could remember, Teo has always loved flowers. “I remember when I was four, my mother would do the floral arrangements for her church. And I would tell her how to arrange the flowers, back then! Since then it’s been something I really love doing,” said Teo, who is from Muar district of Malaysia's southern state, Johor. In secondary school, she would be asked to take care of the floral arrangements for school functions and even her teachers’ houses. Teo’s mother saw that she had a knack for it, so they started selling flowers from their shop and got orders for weddings and other occasions. Right after SPM (Malaysian Certificate of Education), Teo was asked to go to Kuala Lumpur to do the floral arrangements for her English teacher’s sister’s wedding. 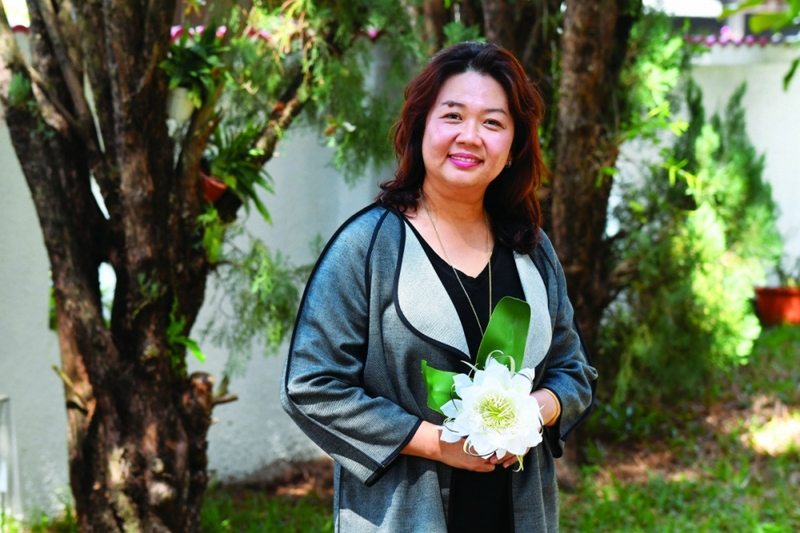 The next day, she followed her aunt to her church, and that’s where she met her first boss, who asked her to work as a florist at the former Ming Court Hotel, now known as Corus Hotel, on Jalan Ampang. She stayed for about six months, earning RM300 (US$72) a month as an arranger. Teo then got a job at a 5-star hotel as chief florist. After staying for one-and-a-half years, she worked at two other florists in Petaling Jaya, Selangor, for a few years. Then when she was 26, Teo left to study floristry in Sendai, Japan, under Tezuka Yuko sinseh. Her teacher soon realised that Teo actually already knew a lot about floristry, so she taught her how to teach others. In 1994, Teo had to come back to Malaysia due to lack of finances, and that’s when she started her own business. Teo later continued to attend a few more classes by Yuko in Japan, as well as from Belgian master florist Daniel Ost and German master florist Gregor Lersch. “I really learnt a lot from Lersch. Because of his elements and principles of design, I was able to come out and apply the teaching like a toolbox and create my own (arrangements),” said Teo, adding that she met Lersch in person in Singapore in 2000. “After that, I finally realised that there are actually many principles behind certain floral arrangements!” said Teo, who has a humble and genial personality. To date, Teo has travelled to over 30 countries to give presentations and talks, and participate in flower shows and competitions, receiving various awards locally and abroad. In 2016, Teo achieved a huge milestone in her career. 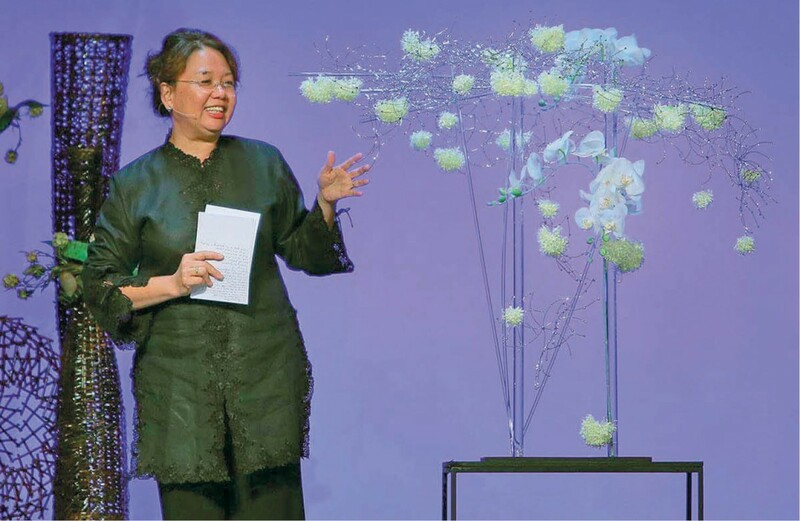 She was invited to present a talk at the AIFD (American Institute of Floral Designers) National Symposium entitled “Inspiration” held in Anaheim, California, attended by 1,000 participants worldwide. Teo was the first Malaysian to be invited. In her presentation called “Burgeoning From My Roots”, she put up 11 floral arrangement pieces and talked about the inspiration behind them. Seven pieces were sold immediately after that.